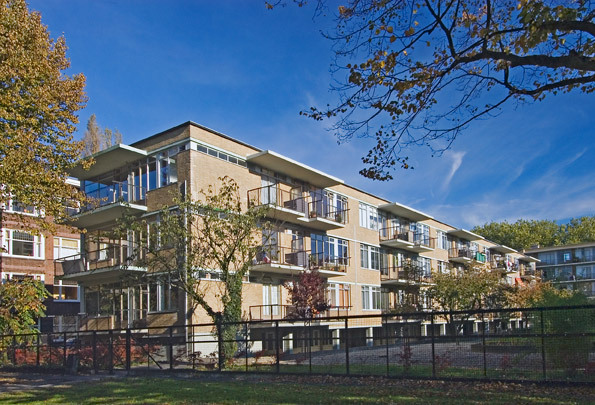 Dating from the 1930s, De Eendracht occupies an important place in architectural history in the transition from perimeter block to open planning. The other blocks along Vroesenlaan are of the traditional perimeter type. De Eendracht is open on the park side and enfolds a large ornamental garden. One of its corners contains a children's playroom. The dwellings are raised half a storey above street level allowing for storage, wash and play space below and are concrete-framed, a rarity in those days. Sliding glass partitions permit a change of internal subdivision between day and night.